Dr. Edgar Dean "Ed" Mitchell, (September 17, 1930 – February 4, 2016), (Capt, USN, Ret.) was an American retired naval officer and aviator, test pilot, aeronautical engineer, parapsychologist, and NASA astronaut. He was the Lunar Module Pilot of Apollo 14. He spent nine hours working on the lunar surface in the Fra Mauro Highlands region. Mitchell was born in Hereford, Texas. Mitchell died under hospice care in Lake Worth, Florida from complications of kidney cancer on February 4, 2016 at the age of 85. 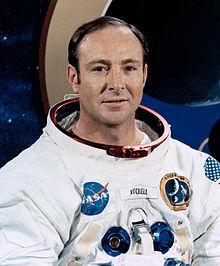 ↑ "Apollo 14 astronaut Edgar Mitchell, 85, dies in West Palm Beach". Palm Beach Post.com. Retrieved February 5, 2016. This page was last changed on 6 February 2016, at 10:22.